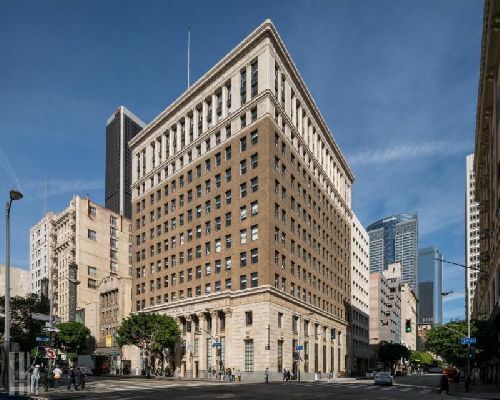 New York-based Sydell Group has completed their conversion of the historic Bank of Italy Building in Downtown Los Angeles into a world-class hotel, bar and restaurant. The building, located at 649 S. Olive St, has been recreated as the NoMad Los Angeles, a unique hotel property featuring 241 rooms, a rooftop pool and lounge and 10k sf of meeting and event space. R.D. Olson Construction was the general contractor for the project. Dining options include a casual restaurant and bar in the lobby, an Italian-inspired café and a formal dining room, all led by Michelin-recognized executive chef Daniel Humm and internationally acclaimed restaurateur Will Guidara. The duo is also behind the dining options at the original NoMad Hotel in New York City and Manhattan’s Eleven Madison Park, currently ranked first on the “World’s 50 Best” restaurants list. New York-based Sydell Group handpicked the 93-year-old structure as its first West Coast location for the popular NoMad Hotel and restaurant. The neoclassical building, adorned with an ornate Venetian plaster gilded ceiling, marble touches and maple wood flooring, were given new life as the second NoMad Hotel. The décor reflects the original Beaux Arts destination in Manhattan, but echoes many of the building’s distinct and historical ties to early LA. During the renovation, R.D. Olson Construction was careful to match the original materials used in the Bank of Italy building – marble, terracotta and wood – to maintain its historic integrity. The Los Angeles Conservancy, a historic preservation organization, provided guidance throughout the restoration process. Project architecture was managed by LA-based Killefer Flammang, with interior design by Paris-based Studio Jacques Garcia. A large, 100,000-pound vault door – a remnant from the building’s early days as a bank – was refurbished and incorporated into the overall design of the ground-floor common areas. Ornate and stately bronze doors at the main entrance were also fully restored, along with the main elevator lobby and the building’s local cast-iron railings. R.D. Olson Construction has a long history of hotel re-use and renovation in the LA area, including the transformation of a six-story 1950s medical office building into the LEED Silver Hotel Wilshire in Los Angeles, and adaptive reuse of a 1960s office building into the dual-brand H Hotel near Los Angeles International Airport.